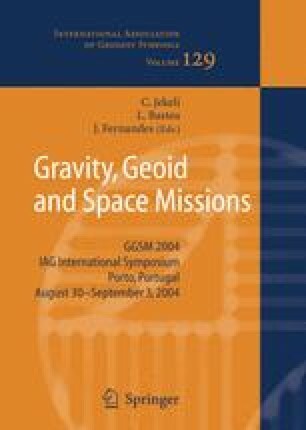 This paper summarises the crossover adjustment of approximately 90,000-line-km of ship-track gravity observations around New Zealand. The adjustment reduced the standard deviation of the ∼106 crossovers from ∼2.0 mgal to ∼0.3 mgal. These data were then used to assess four different grids of satellite-altimeter-derived gravity anomalies. The KMS02 altimeter grid was selected for use around New Zealand as it gave a better fit to the coastal ship-track data. Least-squares collocation was then used to ‘drape’ the altimetry onto the crossover-adjusted ship-tracks to counter the well-known problems with satellite altimeter data near the coast. The precision of this merged ship-altimeter gravity dataset is estimated to be 3.5 mgal.